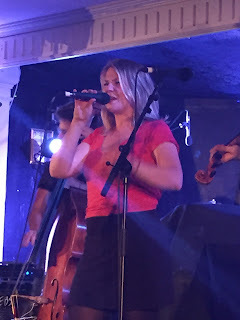 Its name belied the northern location of the host city, but undeniably the air was full of sounds, smells and sentiments that meant for one weekend Perth in Scotland could make a valid claim as the UK’s capital of American roots music. The Southern Fried Festival resumed its role as a pre-eminent force in fulfilling a desire for folks to indulge in a romantic love affair with cultural and culinary offerings from that collective group of states affectionately known as the ‘Deep South’. Alongside the daily serving of inventive soul food (far from your usual feast of festival transient cuisine), the organisers once again invited an exceptional band of guests to ensure the whole pot of bubbling roots music was represented with artists excelling in styles such as gospel, soul, blues, bluegrass, country, folk and Cajun. Throw in some good ole rock n’ roll and that indefinable genre of Americana into the mix before being served expertly by home grown artists from either side of the border, all perfectly at home in the company of the highly respected stateside visitors and the stage was set for three days to linger long in the memory. This pure city centre located festival had three musical epicentres weaving its magical sounds from a mild mannered midday start to an early hour conclusion that showed little sign of refrain once the 2 am formal curfew had played its hand. Whether you wanted to relax in the grandeur of the three formal shows in the city’s concert hall, catch some very good local talent on the nearby outside stage or check out a plethora of outstanding semi intimate sets at a nearby hotel, the menu was comprehensive and full of class acts. 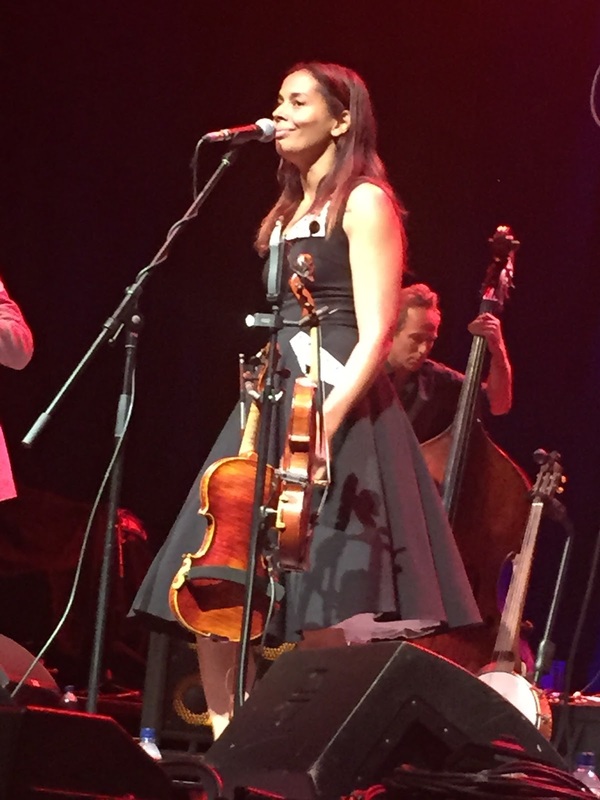 The term class is just one of a landslide of superlatives to label Rhiannon Giddens who opened the main proceedings with a twin billed show in the hall alongside those icons of modern classical bluegrass, the Chris Thile-led Punch Brothers. Rhiannon elevated her status tenfold with the debut solo album TOMORROW IS MY TURN released earlier this year and this aspect of her career is set to spiral in a vertical direction. The hour long set, which was backed by an excellent band including fellow Carolina Chocolate Drop Hubby Jenkins, was splendidly populated with songs from the album such as ‘Waterboy’, ‘Up Above My Head’ and ‘Black is the Colour’. 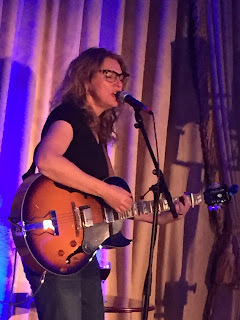 Additionally the home audience enthusiastically greeted the song sung in Gaelic as Rhiannon celebrated the Scottish heritage thriving in North Carolina. Following the ecstatic reception Rhiannon received from the audience was going to be a tough task for the Punch Brothers and one made tougher when technical problems beset the early stages of their set. However the solution was probably the one folks came to see anyway as leads were ditched and all five players shared the single mic. With their take on bluegrass bordering on classical virtuosity, it is a joy to just sit back and marvel at the exceptional playing and intricate timing. Early difficulties were soon discarded as the mash of mandolin, fiddle, banjo, guitar and bass took control. Perhaps a little fine ear tuning is required to grasp the breadth of their talents and an a Cappella delivery of ‘The Auld Triangle’ showcased sublime harmony to marry neatly with the exalted musicianship of the Punch Brothers in full flow. 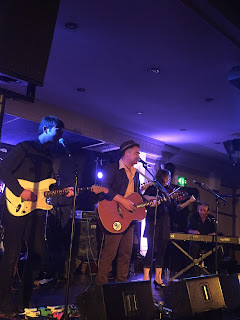 With the sound of first class American roots music ringing in your ears at the conclusion of the Friday night headline concert, it was a quick five minute hop across town to the Salutation Hotel and another three hours of live music to herald in the new day. The choice on offer to festival attendees is either a couple of up tempo shows downstairs with a full band or a singer-songwriter showcase upstairs. For the first hour a decision was made to carry on with the bluegrass theme with the alternative take on the genre from Grammy nominated act Della Mae. Fronted on stage by the vivacious and sassy Celia Woodsmith, this five piece combo assembled from several locations across the North American continent have fast become the find of summer ’15 with their entertaining songs, engaging personalities and effortless connection between artist and audience. In a slight deviation from the earlier dates on the UK tour, the band was heavily focussed on preparing for the following night’s extravaganza which was to further seal their outstanding introduction to UK audiences. 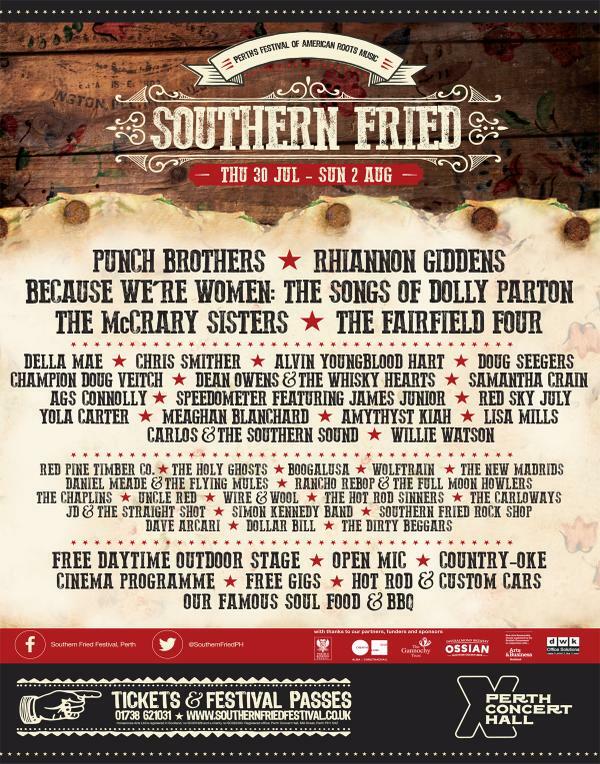 The lasting memory from Della Mae’s set was that ‘Boston Town’ is now fully endorsed as one of the songs of summer ’15. The remainder of this first evening of Southern Fried was spent in the company of two singer-songwriters at different ends of my musical awareness and split by an ocean in their nationalities. Bristol based, Yola Carter is a new name to me and this introduction to her style of song presentation made a positive impression and ignited a flame to check more of her work in the future. Like so many artists this weekend, appearances weren’t confined to their solo slot and on two further occasions we were granted the pleasure of listening to Yola sing. 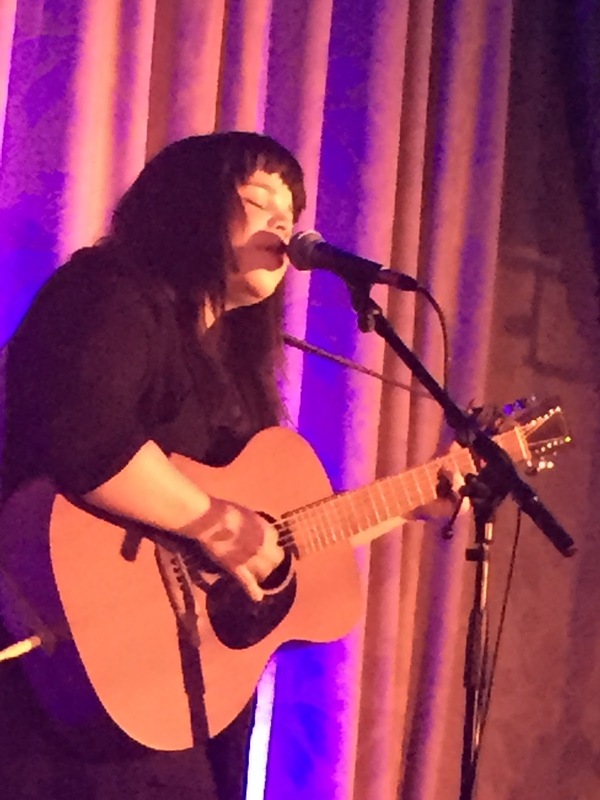 In contrast, Samantha Crain, who directly followed Yola onto the stage, is well known in these quarters having enjoyed her Edinburgh gig last year and adding a couple of her albums to the collection. This incredibly dedicated songwriter from Oklahoma keeps the UK very much on her horizon evidenced by multiple visits to balance her homeland adventures which has included support slots for First Aid Kit and Buffy Sainte-Marie. Armed with a considerable number of CD and vinyl versions of her new album, UNDER BRANCH & THORN & TREE, to sell, Samantha did her utmost best to tempt punters late into the night to part with their cash by extolling all the favourable merits of an accomplished singer-songwriter. The new record is also now safely in my collection. Saturday at Southern Fried saw music spring up in three locations with the launching of the outside stage to supplement the concert hall and the hotel. 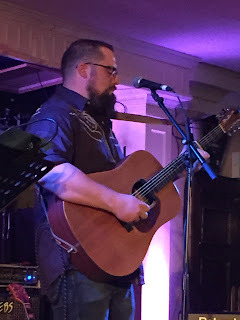 The latter’s offering was now extended to a full afternoon gig which saw old pals Ags Connolly and Dean Owens team up for a twin set of border crossing country, roots and Americana music. Ags opened this show in the Salutation Hotel with a sterling performance of traditional country music flanked by a couple of extra musicians to enhance his usual solo status. Ags was returning to the format he used at the same festival twelve months previous and it also engineered a meet up with Dean Owens who produced his acclaimed debut album. If Ags represented the south of these isles, then Dean is firmly planted north of the border and used this homeland gig to re-assemble his Whisky Hearts backing band to add extra zest to his growing back catalogue in a live setting. This was the first opportunity to spend more than a fleeting acquaintance with the music of Dean Owens and the resultant purchase of his new record INTO THE SEA cemented a growing appreciation for how he perfectly blends the Americana spirit into songs inspired by feelings, events and observations closer to home. 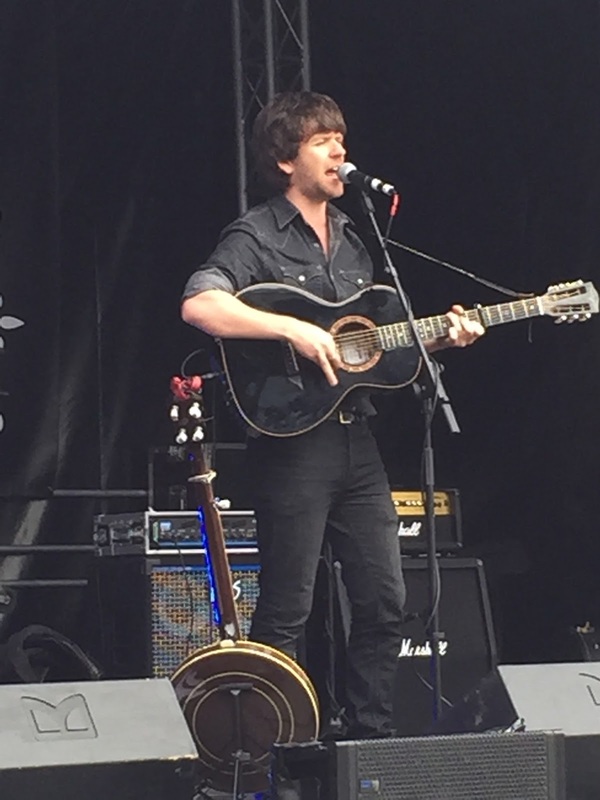 The decision to attend the inside gig, which took up most of the afternoon, meant time was very limited to catch the mainly Scottish acts who frequented the outside stage. 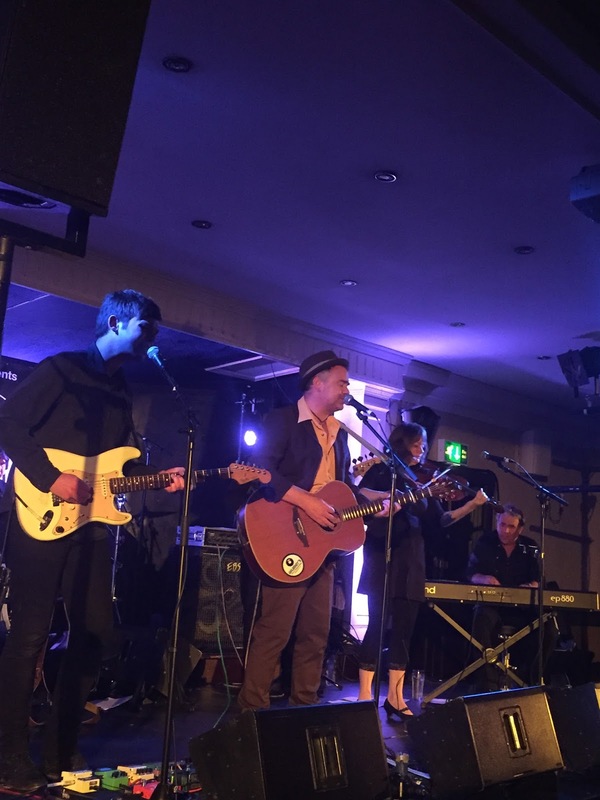 However two bands caught the eye as events wound down before the evening’s entertainment. Boogalusa from Dundee used their five o’clock slot to prove that Cajun and Zydeco music Louisiana style was the new rock n’ roll, well at least for an energetic forty five minutes. 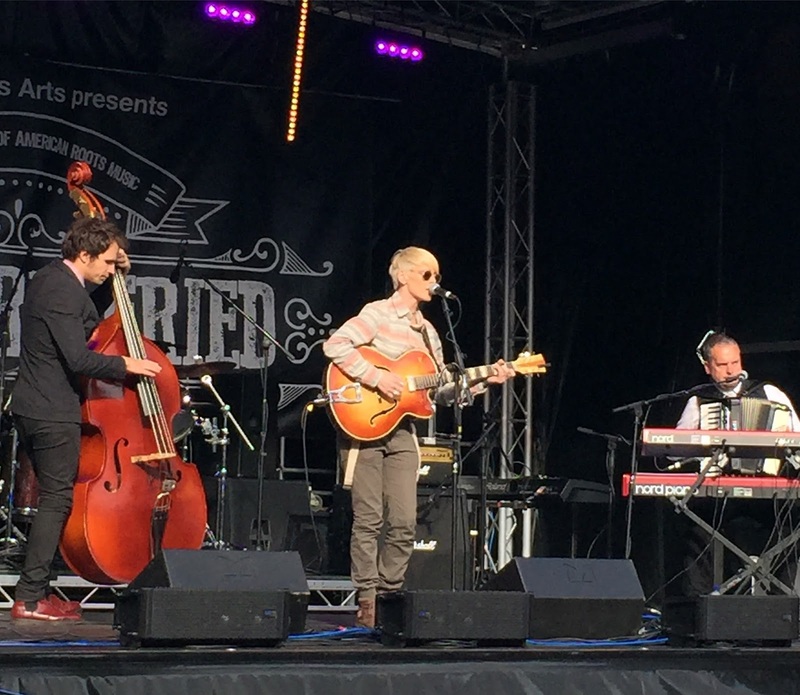 The Chaplins secured the ‘headline slot’ on the outside stage as the audience was swelled by those early arrivals for the nearby concert hall show. 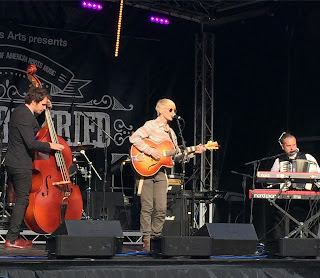 This heavily influenced Americana band from Glasgow led by Jill Jackson played a rousing set to an impressive degree leaving a lingering memory that there is much more on offer from them. Having perused the festival line up from the previous year, it was hard not to feel a little short changed from the Saturday evening headline show in the Perth Concert Hall as in lieu of another original artist being added to the bill, the organisers elected to present a tribute show to the songs of Dolly Parton albeit commissioning the outstanding talent already present to appear. This is not saying it wasn’t a thoroughly entertaining show as each performer shared their own take on the iconic singer and the evening was not confined to a string of sing along hits. Despite her legendary status and undeniable global appeal, the songs of Dolly Parton don’t really move me to the limits of their widespread adulation and while each artist put their exemplary heart into the show there was still a slither of a hastily arranged production. Della Mae pulled out all the stops to choreograph the evening and provide backing band duties while an array of vocalists took turns to select a Dolly song to share. While it has to be admitted that far more pleasure was derived from seeing each artist deliver their own material over the weekend, there was an emotional highlight of Jenni Lyn from Della Mae pouring out her heart with a stunning tearful version of ‘The Grass is Blue’. 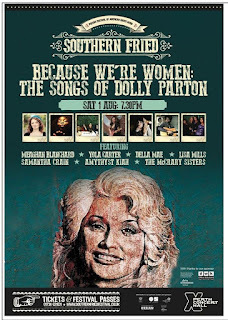 Of course the enduring appeal of Dolly meant that this was the best attended event of the weekend and maybe it played a commercial role to help support the underlying ethos of the festival. 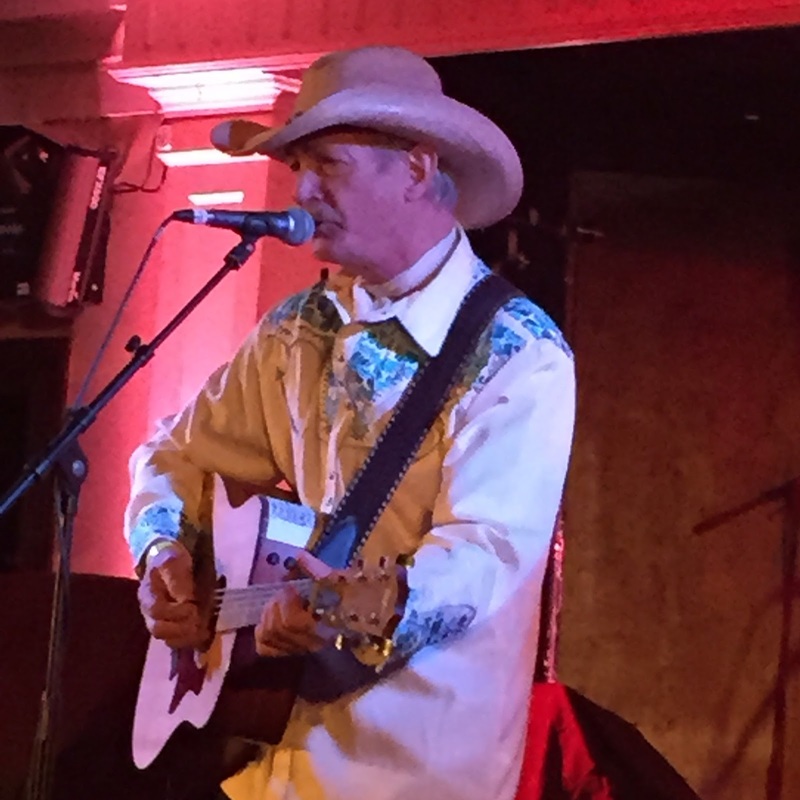 No sooner had the ubiquitous ‘9 to 5’ closed the ‘main event’, the eagerly awaited set by Doug Seegers commenced at the other nearby venue. There was definitely no short change from a performer who epitomises the notion that true talent will eventually find an outlet. From the streets of Nashville to superstardom in Sweden has been a barnstorming journey for sixty two year old Doug whose talent has finally been recognised to the extent that he has just been bestowed an Emerging Artist nomination at the upcoming AMA awards. Doug’s outstanding new album GOING DOWN TO THE RIVER with its stellar title track formed the centrepiece of his set which was supported by a three piece backing band led by the magical fiddle playing of Barbara Lamb. If anything Doug’s model country voice was even more fetching when bridged by just a microphone and there was a common consent that a top notch country performer was in our midst. As per the previous evening an identical decision was made to spend the first part of the late night slot downstairs before venturing upwards to calmer surroundings. 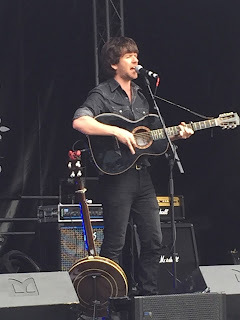 Not that the upstairs room was any less packed as Willie Watson took to the stage to adulated acclaim from his many fans frequenting the audience. Willie’s cult appeal has grown significantly since he departed the Old Crow Medicine Show with his debut solo release being produced by roots impresario Dave Rawlings. With a slightly quirky and surreal stage presence, Willie cuts right into the heart of traditional American folk music. It may have been well past the midnight hour but Willie’s famed version of ‘Midnight Special’ had everybody singing and in full appreciation of an artist on top of his game. There was only a slight movement in the audience between the sets of Willie and the artist who brought the curtain down on the festival’s ‘Late and Southern Fried’ programme. Any American roots festival needs a healthy portion of the blues and straight from Mississippi via a number of other places Lisa Mills was in full voice to meet the requirement. Lisa has been a regular visitor to the UK for a number of years and was first seen a while back supporting Seasick Steve at Dudley’s iconic, but now defunct venue, JB’s. Fast forward to this evening and this powerhouse vocalist was in full throttle to ensure those not too familiar with the wee small hours of the morning didn’t doze off. Whether interpreting covers or presenting original material in classic blues style, Lisa took the curfew to its limit in fine style. A slight detour through the hotel bar on the way out revealed the informal replacing the formal with the sound and vision of Kimberly from Della Mae jamming with Doug Seegers, leaving it to the imagination as to when ‘Late and Southern Fried’ unofficially ended. With the late night option off the menu for the festival’s final day, the only choice was to either spend an afternoon watching the outside artists or venture one more time to the hotel for the double bill of Chris Smither and Alvin Youngblood Hart. It was decided to invest some time in watching the up and coming acts, which was slightly made easier with the scheduling of Daniel Meade and the Flying Mules at three o’clock. Aided by ace guitarist Lloyd Reid and the rest of the band, Daniel reeled off a deluge of timeless toe tapping tracks depicting an age where country music was simpler and reaching out to an audience moved by a core rhythm unsinkable in its appeal. Twelve months after discovering Daniel from his Sturgill Simpson connection, the passion is still flowing, the guitar is still strumming and the songs continue to effortlessly spill out. The acts in the hotel may have had more esteem, but it would have been tough to leave Daniel’s homeland without witnessing a storming forty five minute set from him. So to the festival finale and it’s a return to the Perth Concert Hall for one final time with the missing pieces of soul and gospel to be finally found in the form of two highly acclaimed US artists. In a double billed show titled ‘Rock My Soul’, The Fairfield Four and The McCrary Sisters sandwiched a pair of individual sets within two collaborative pieces to ultimately get right deep into the heart of what the South is all about. This latest line up of The Fairfield Four, an active group since the 20’s, possessed its fair share of experience and they sold their vision inspirationally through a distinguished set of a Cappella numbers proclaiming their faith and uniting contrasting strands of the secular spectrum with full blooded believers. The McCrary Sisters were also not to shy away from the faith angle and used the full breadth of their sisterly harmony to fill the hall with a heavenly atmosphere of spiritually influenced southern soul. 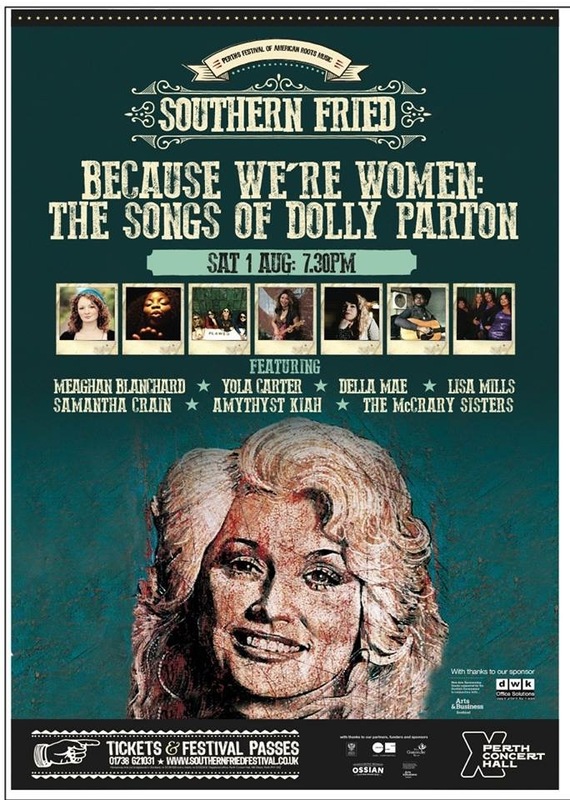 This excellent pairing closed the loop of the American roots tradition and if you’re going to put the word ‘Southern’ in your festival’s title then ensure that no musical stone is left unturned. As a side line to the truly authentic food and the brilliant blend of high class genuine American artists with those from our shores doing it the right way, the organisers also presented a number of American roots music themed films in conjunction with the local picture house. So a couple of ‘down time hours’ was spent watching ‘Another Day, Another Time…’ and ‘Down From The Mountain’. Both presentations were perfectly in sync with the mood of the festival with the former featuring the music inspiring the film ‘Inside Llewyn Davis’ and the other from that roots revival centrepiece ‘O Brother, Where Art Thou’. A cinema setting with surround sound made a great environment for watching both films as they each were based on a concert featuring some of America’s finest contemporary roots artists. There was no better way to start a twelve day Scotland trip than three days on the banks of the River Tay soaking up sounds more akin to the Mississippi, Cumberland, Ohio etc. 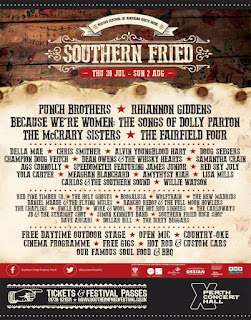 Southern Fried deserves full praise for booking so many superb artists and organising a festival which rarely strayed from its ethos and mission statement. Overall the organisation and presentation was first class with an acute eye on maximising local interest which eventually will be the lifeblood of an urban festival away from heavily populated centres. 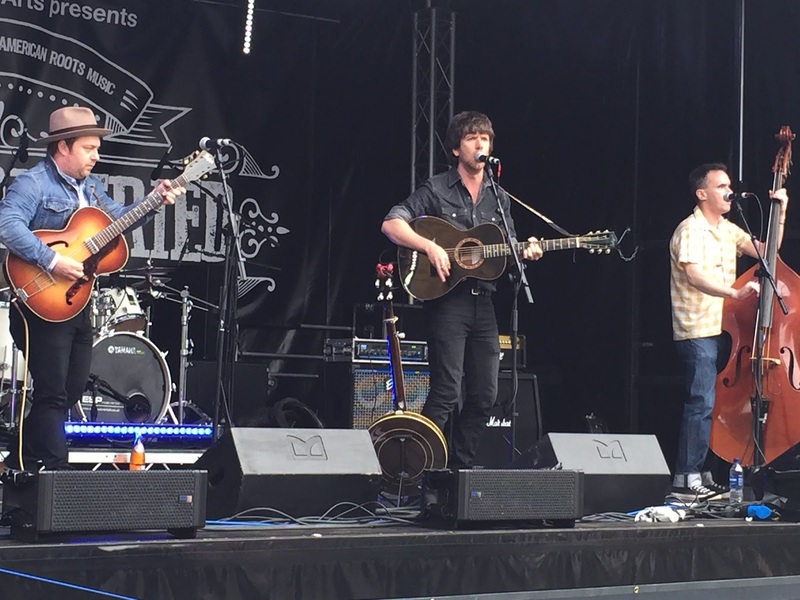 Southern Fried continues to find the winning formula and it is without doubt that this festival will keep Perth on the UK’s Americana landscape whilst continuing to flourish in the future.